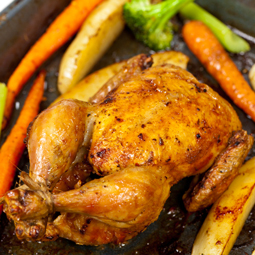 Wild Rice and Cranberry Stuffed Cornish Game Hens - A recipe from Savor California, the online showcase for extraordinary gourmet foods and beverages from California. Combine wild rice, Basmati rice, cranberries, sausage, apple, celery and salt and pepper. Stuff game hens. Close with toothpicks. Place game ens in a 10x13" glass or Pyrex baking dish. Squeeze orange juice over game hens. Sprinkle seasoning over game hens. Bake for 1 hour or until meat is no longer pink next to the bone. Remove from oven and serve with any extra rice stuffing. Recipe courtesy of Marla Clark, Moriarty, New Mexico.